Whenever a nontoken creature is put into your graveyard from play, remove that card from the game. At the beginning of your upkeep, you may pay (4) and 2 life. If you do, return a card removed from the game with Purgatory to play. No Purgatory ? It is an amazing engine to recur Elenda! 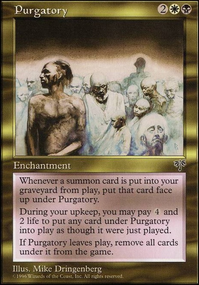 Why no Purgatory ? It looks pretty sweet in this deck! 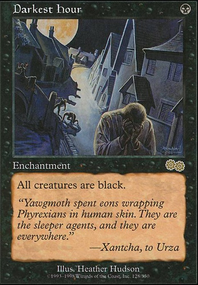 Magicaids, Purgatory doesn't help you recur cards, it only helps you not need recursion after you get it down. That's why it isn't good enough for the list, if that makes sense. 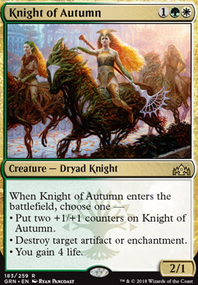 eljeffe_demagico, there are plenty of cards that will let you get a creature from your graveyard onto the battlefield for less than 5 mana, and even in mono white, there are a few. 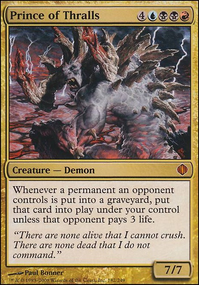 griffstick, while Mortuary Mire is good in the same sense that a Disentomb is, Mortuary doesn't help you recur cards, it only helps you not need recursion after you get it down. That's why it isn't good enough for the list, if that makes sense. Lord_Khaine, glad I could help! I'm glad you already know about Hatred. That would have been my first suggestion. Cathars' Crusade will useful. Make 10 tokens from Elenda and they all get 10 +1/+1 counters. Just pure value. Well of Lost Dreams. 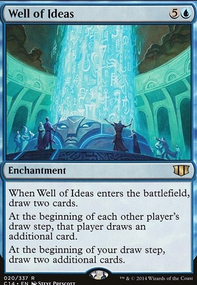 Lifegain seems to be a secondary theme here, but having this around to draw some extra cards will always be good. Eldrazi Monument. Just a nice way to buff all your tokens. Edict effects go hand in hand with sac outlet decks. Dictate of Erebos, Grave Pact. Mentor of the Meek. Again, more card draw. Sigil of the New Dawn. Return Elenda to your hand immediately. I'm considering making an Elenda build. One avenue I was thinking was graveyard hate. Really unconventionl strategy here but maybe it'll work. Planar Void, Purgatory(could choose the 2 life over 2 mana. Good deal), Mortuary, Cremate(also draws you a card), Withered Wretch, Thraben Heretic could all be useful. Just some thoughts. Hope some of this helps! I'll keep following this with interest. I just finished making my deck list for my Karador deck Purgatory and I wanted to see how it looked against other spirit decks.